One of the most prestigious titles in print journalism is joining the ranks of organized labor. Staff members at The New Yorker sent a letter Wednesday morning to editor David Remnick informing him that they have formed a union, citing a lack of job security and salary disparities as two of the chief motivating factors. 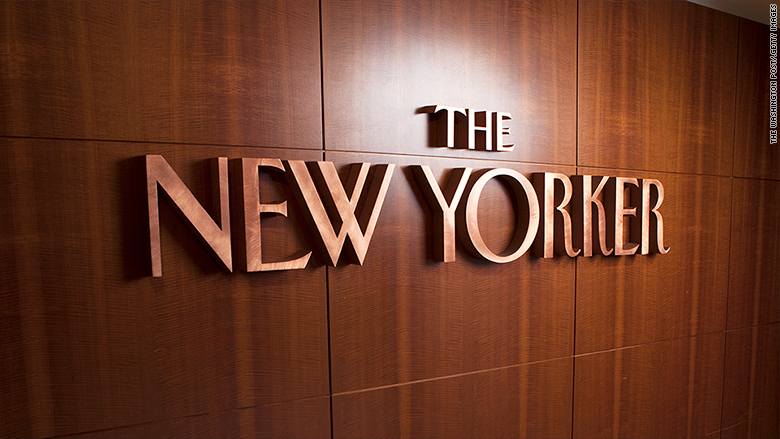 "The New Yorker has been a vital force in American journalism for nearly a century. Its deeply reported, clear-eyed, and principled stories have consistently challenged power and exposed injustices and abuses in communities of all kinds," the letter said. "We, the editorial staff of The New Yorker, are very proud of this legacy, and of our place in it. But we believe that the publication must work harder for its employees; the values that run through its pages should be better reflected in the culture of its workplace." New Yorker staffers have organized with the NewsGuild of New York, and they are among a growing number of journalists -- both print and digital -- who have sought a union. The NewsGuild said nearly 90% of staffers have signed on to the unionizing efforts. On Wednesday, editorial, social and photo staff members at Fast Company also announced the formation of a union with the Writers Guild of America, East. Earlier this spring, staff members at the Chicago Tribune formed a union, which was recognized last month by the paper's owners, Tronc. Like the Tribune, the New Yorker has a history of being anti-union. In the 1970s, management at New Yorker successfully staved off a union drive. Spokespeople for The New Yorker and Condé Nast, the magazine's parent company, did not immediately respond to a request for comment. Remnick, something of a liberal lion, will certainly face pressure from his ideological peers, but he may be advised by Condé brass to squash the effort, lest other publications at the company follow suit. In their letter on Wednesday, New Yorker staffers painted a rather bleak picture of the work environment, one that runs counter to the glamour associated with the magazine, which has a lofty newsstand price of $9. The magazine's revenue is driven largely by readers, rather than advertisers, and earlier this year it set a bullish goal to double paid subscribers by 2023. But staffers indicated that the profits have not trickled down, saying in the letter there "is no clear system for tying compensation to performance, no codified method of evaluation, and few opportunities for career development." They said the magazine "is vulnerable to competing priorities from our corporate parent, Condé Nast." "Behind each New Yorker story is a team of editors, fact checkers, designers, producers, and social-media strategists. We bolster and polish the reporting and writing of our authors, and do the granular work of upholding the magazine's high standards. Yet we lack job security and, for the most part, receive no overtime pay," they said in the letter. "Salaries often vary significantly among people who hold the same position, and we have seen a steady stream of our colleagues leave for jobs that provide more tenable wages. Some of us have worked for years as subcontracted employees, without health insurance and other basic benefits, though we do the same jobs as the staff members who sit beside us." They added: "We are determined to do everything we can to protect the health and the integrity of our publication from staff cuts and reorganizations handed down by corporate management without warning or transparency. We believe that the ability to collectively bargain is the best way to secure a fairer workplace and to insure that the people who produce The New Yorker can continue to do so far into the future. We are asking Condé Nast to recognize our union, and we look forward to beginning an amicable collective-bargaining process."